A panel discussion on tech transformation at TechHR Singapore 2019 highlighted the tremendous need to reflect on the two of the most crucial organizational elements that must to be aligned in order for firms to compete successfully while gaining sustainable advantage in the industry. An organization’s culture is a complex and deep constructs that influences ongoing tech transformations in various ways. Leadership and culture are considered to be crucial for firms to compete successfully and to gain sustainable advantage. 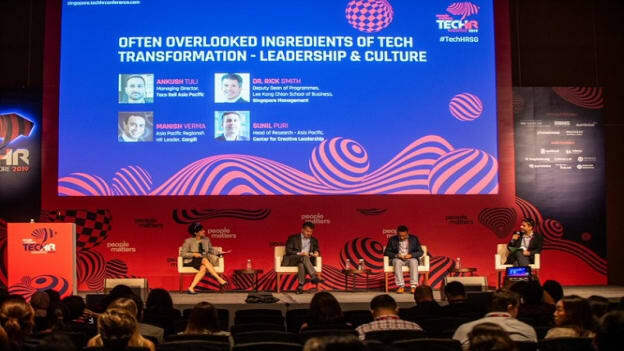 Setting the context straight the panelists at TechHR Singapore Conference 2019 shared their views and experiences on how overlooking leadership and culture presents a clear risk to organizations attempting to undergo tech transformation efforts. An insightful discussion chaired by Sunil Puri – Head of Research, Asia Pacific CCL, joined by prominent experts including Manish Verma – Asia Pacific Regional HR Leader, Cargill, Meghna Shukla - Global VP Talent, Supply Chain, Schneider Electric and Rick Smith – Deputy Dean of Programmes, Lee Kong Chian School of Business, Singapore Management University shed light on the topic with great energy and enthusiasm. Undoubtedly the culture of an organization becomes the most significant strategic variable that executive leaders need to manage effectively during a tech transformation. Sunil Puri began the discussion by rightly pointing out how the three essential elements – ‘Direction, Alignment and Commitment’ plays a crucial role in shaping an organization’s culture during any transformation process. And each time when the organization goes through a change, these elements become more vulnerable. Hence, organizations need to stay clear of these vulnerability points and address them beforehand. Understanding of the basics - ‘What do we need, where are we going and what is it that needs to be changed’? Clarity on the end result – ‘What are the actions we are looking at the end? Rick Smith also felt that leaders need to effectively articulate the journey of their tech transformation. They need to get involved, follow through and take actions rather than just initiate the transformation. Leaders must assume the role of the chief evangelist to persuasively, persistently and convincingly articulate and communicate the “why” behind each initiative and champion such tech changes, to create positive business impact. Meghna too emphasized that communication is one of the most crucial factors when it comes to acceptance of the transformation to its internal as well as external stakeholders. She also suggested leaders be agile when it comes to walking the talk. Another key point that was discussed relates to emphasizing ‘Customer and Culture’ coherently. Don’t lose sight of your customers. Become change agents for both – customer and culture. This involves all business leaders including HR and functional heads. And lastly, the panelists stressed upon creating an environment where employees have more psychological safety. Manish reaffirmed that psychological safety is must as it plays a major role in accepting the change. With more new mindsets and new leader behaviors, there is a greater need to address the readiness gap. And these pointers definitely make it a more important factor for long-term success. To sum up, culture and leadership that focuses on both employees and customers with fluidity to adapt to tech changes through its openness and inclusivity quotient propel the organization’s ability to evolve continually and embrace uncertainty and ambiguity at any point of time. Such organizations are far better equipped than the traditional ones for the future. However, each tech transformation journey is unique. Hence, the two absolute requirements for making the journey successful is directly linked with setting the right culture for transformation through an effective leadership strategy. As the speed of technological innovation continues to increase and as competition to deliver better and faster overpowers organizations, these two overlooked factors will be the deciding factor in who wins and who loses the game in the longer run.